Wanted: Music Groups, Drama Groups, Speakers, and Demonstrators. New performances have been added. Camp will be held at the beautiful Camp Kiwanis on the St. Croix River, just ten miles north of Stillwater, Minnesota. This site has all the accommodations for an exciting camping experience. Recreational facilities at Camp Kiwanis include: 30’ x 60’ outdoor swimming pool, basketball and tennis courts, sand volleyball court, tetherball area, canoeing, large campfire circle, craft building, wilderness hiking trails, and softball diamond. Transportation to Camp: Several bus stops will be available. The bus cost is included in the camp fee. Registration: 2019 PoCroixBar Camper reg form Parents: Registration is on a first-come, first-served basis. Don’t delay! 4-H OUTPOST Camp! Get ready for a camping adventure. This is a new camp experience offered to 7th and 8th grade youth. The wilderness is calling you…are you up to the challenge of 3 days / 2 nights of outdoor adventure and fun! Tent camping, fire cooking, canoeing, swimming and hiking are just a few of the exciting experiences that await campers at OUTPOST Camp! There will also be team building and leadership development along with fun and games throughout camp…don’t miss out. 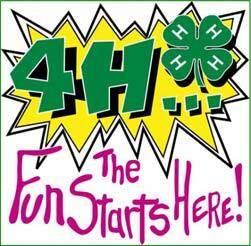 4-H OUTPOST Camp will take place at Camp Kiwanis during the same time as regular 4-H camp. Please note that these two camps will have separate schedules and activities. Registration: 2019 PoCroixBar Outpost Camper reg form Parents: Registration is on a first-come, first-served basis. Don’t delay! Ready for a Wisconsin adventure!!! 4-H Youth grades 5th—8th are welcome to register for our upcoming adventure to explore the great state of Wisconsin. Each year we will be choosing a new area of the state to explore. This year we will be traveling south to La Crosse, WI. During our WI Tour travels we will learn about Wisconsin history and culture, learn about Wisconsin industries, explore the outdoors, and have a ton of fun! The cost of the trip is $150.00 / youth. Financial assistance is available for families who request it. Contact Heather for financial assistance. Registration is on a first come first serve basis. There are only 32 spots available, so hurry and register right away. Once we have filled our spots additional youth will be put onto a waiting list. Registration deadline is June 21.